In the spring of 1991, the City began the construction of a recreational loop system of pathways around the community. Each loop is designed to connect neighborhoods with schools, parks, and commercial centers. Funding for the majority of the system was provided by the bond measure approved by the voters in 1990. The system was established to enable residents to travel safely by foot, bicycle, or in-line skates. 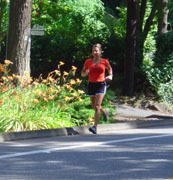 Users are invited to enjoy the scenic beauty of Lake Oswego on the many miles of tree-lined, interconnected, paved pathways while getting beneficial fresh air and exercise. 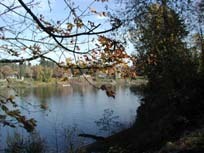 The Old River Road Pathway offers a scenic route along the Willamette River. The pathway begins in lower George Rogers Park, across the footbridge and up and around the point to Old River Road. 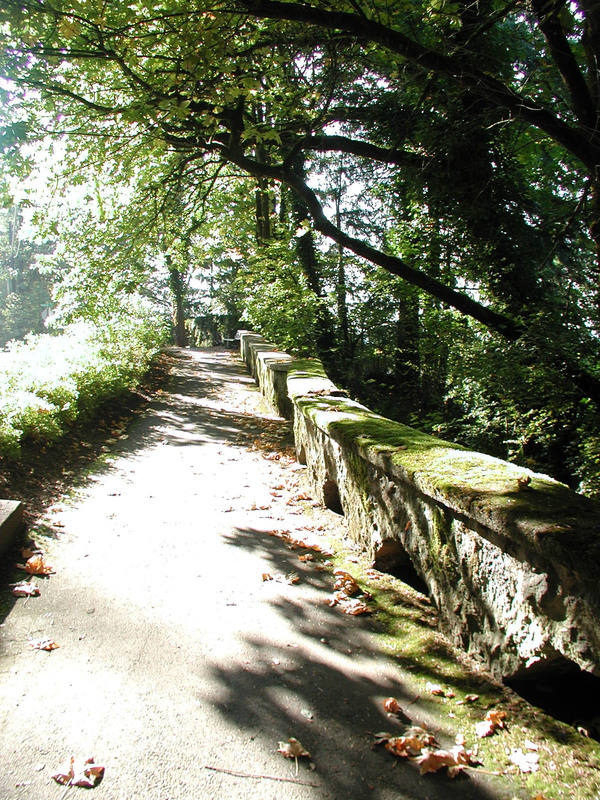 The pathway runs between the river and the road to the boundary of West Linn and Lake Oswego. Once the pathway ends, walkers may choose to continue along Old River Road to its intersection with Hwy 43, near Mary S. Young State Park. This mostly level pathway is bordered by private property and offers no river access. This is the most popular loop in Lake Oswego. The beautiful waters of Oswego Lake are visible from many vantage points as the route weaves west from Stafford Road along South Shore Blvd. At Lakeview Blvd. you can branch west to the Bryant Road path or take the main loop route east to the stairway on the north side of Lakeview. Go up the stairs to Upper Drive and continue east to the Lake Oswego Hunt Club. Proceed along Iron Mountain Blvd. to Chandler Road, and then to A Avenue. Turn east and continue to State Street. Head south on State Street to McVey Avenue and follow McVey to South Shore to complete the loop. Golf Course, Lakeridge High School, Westridge School, Waluga Junior High, Bryant School. The loop takes you south on Stafford Road past the Lake Oswego Golf Course. Turn west on Overlook Drive past Lakeridge High School. Continue on Royce Way to Bryant Road. A spur route to the south on Bryant takes you to Childs Road and the River Run neighborhoods. The main loop proceeds north on Bryant to Lakeview Blvd. Turn east on Lakeview to South Shore Blvd. and follow South Shore back to Stafford. Mormon Temple, Southwood Park, Oak Creek School, Westlake Park, Waluga Park, Lake Grove School. Starting from the corner of Carman Drive and Kruse Way, proceed west to Kruse Oaks, north to Southwood Park, and then east on Suncreek Drive and Melrose Street past Oak Creek School and Westlake Park. Turn on Botticelli and continue east to Touchstone. Go north to Kerr Parkway, then travel east to Boones Ferry Road, south to Kruse Way, and west to Carman Drive. To continue the loop, proceed south on Carman to Quarry Road. Turn on Quarry, continue across Oakridge Road to Boones Ferry Road, and proceed south on Bryant Road to Lakeview Blvd. Or, at Oakridge, it is possible to turn west to Waluga Drive and north on Waluga to Carman. Alternately, turn east on Oakridge and continue to Reese Road, then to Upper Drive. Encircles Oswego Lake Country Club, Lake Oswego Junior High, Springbrook Park, Uplands School, Lake Oswego Hunt Club. 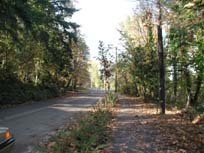 Beginning at Iron Mountain Blvd., the pathway follows the south side of Country Club Road and the east side of Boones Ferry Road to Reese Road where it turns south to Upper Drive. Proceed on Upper and Iron Mountain, back to Country Club. Picturesque paths have been finished through George Rogers Park between State Street and Old River Road and on the southwest side of Highway 43 in front of Marylhurst Heights. In the original development, these pathways were planned as part of a loop called the Willamette River Loop. They may be extended to serve Hallinan School and improve safety on Old River Road. Starting at Andrews Road and 10th Street, the path goes west on Andrews past Forest Hills School. At Atwater Road and Iron Mountain Blvd., there is an entrance to Tryon Creek State Park. Continue along Iron Mountain to Country Club Road, turn west and proceed to Boones Ferry Road. This pathway serves portions of downtown Lake Oswego on A Avenue and North State Street. This segment was planned as part of a loop to be called Downtown/Forest Hills Loop. Over time, it may be completed by extending the pathways into areas on the north side of the city.